Write seven reasons to be thankful on tiny pieces of paper, and tie one to each button on the turkey's tail. Ask family members to read them during your Thanksgiving feast. Felt Colors: 2- sheets each pumpkin, antique gold; 1- sheet each cinnamon, hunter green, ruby. down at 2, up at 3. Trace the patterns from the pattern section and cut as indicated. 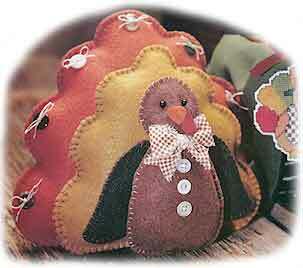 To make each turkey section, align and pin the matching felt pieces. See the illustration below to work blanket stitches around each section with three strands of floss. Use brown floss to stitch each tail and gold floss to stitch the body, lightly stuffing each section with fiberfill as you work. Use brown floss to work stitches around each wing; do not stuff. Use black thread to sew black bead eyes to the head where indicated by dots on the pattern. Refer to the photo to hot-glue the beak and wattle below the eyes. Use linen thread to sew an X in two 3/8-inch (1.0 cm) 4-hole buttons and a straight stitch in the 3/8-inch (1.0 cm) 2-hole button; knot ends. Glue the buttons to the turkey's breast where indicated by dots, with the 2-hole button in the center. Tie the fabric strip in a bow. Cut V’s in the ends. Glue the bow to the neck. On a flat surface, align the two tails and body upright; pin in place. Pin the wings behind the body with pointed ends down and round ends even with the neck. Hot glue the body and wings to the small tail, and the small tail to the large tail, removing pins as each section is glued. Thread each 1/2-inch (1.3 cm) button with a 6-inch (15.2 cm) length of linen thread. Tie a 1-inch (2.5 cm) bow on the front of the button; trim ends. Refer to the pattern to glue a button/bow to each tail feather where indicated by dots.